Letter size 2mm. Contents A to Z plus and symbols. 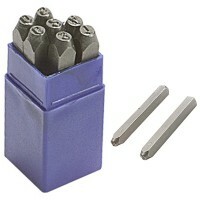 Letter Punch Set made from hig..
Letter size 10mm. Contents A to Z plus and symbols. 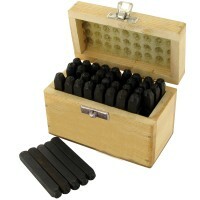 Letter Punch Set made from hi..
Letter size 8mm. Contents A to Z plus and symbols. Letter Punch Set made from hig..
Silverline 273197 Letter and Number Stamp Set Features 36 piece letter and number stamp s.. Number size 10mm. Contents 1, 2, 3, 4, 5, 6, 7, 8, 9 and 0 (9 is achieved by reversing ..
Letter size 4mm. Contents A to Z plus and symbol. Letter Punch Set made from high..
Letter size 6mm. Contents A to Z plus and symbols. Letter Punch Set made from hig..
Letter size 5mm. Contents A to Z plus and symbols. 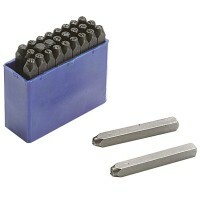 Letter Punch Set made from hig..
Letter size 12mm. Contents A to Z plus and symbols. Letter Punch Set made from hi.. Number size 2mm. Contents 1, 2, 3, 4, 5, 6, 7, 8, 9 and 0 (9 is achieved by reversing 6.. Number size 5mm. Contents 1, 2, 3, 4, 5, 6, 7, 8, 9 and 0 (9 is achieved by reversing 6.. Number size 3mm. Contents 1, 2, 3, 4, 5, 6, 7, 8, 9 and 0 (9 is achieved by reversing 6.. Number size 4mm. Contents 1, 2, 3, 4, 5, 6, 7, 8, 9 and 0 (9 is achieved by reversing 6.. Number size 12mm. Contents 1, 2, 3, 4, 5, 6, 7, 8, 9 and 0 (9 is achieved by reversing .. Number size 6mm. Contents 1, 2, 3, 4, 5, 6, 7, 8, 9 and 0 (9 is achieved by reversing 6..